Regular readers might recall this writer isn’t wedded to only using fluids for circulating into geothermal reservoirs. A link sent by a reader led to a fellow well on the way to having a ground source geothermal system that transfers energy with air instead of water, antifreeze or other fluids. Its an air to air to geothermal vs. air to fluid to geothermal contest. And its dirt cheap to install, very energy efficient to run, and would work anywhere one can dig without hitting rock or permafrost. Russell Finch of Alliance Nebraska developed an interest in geothermal heat in 1979, while planning the heating system for the family’s soon to be built A-frame house. Mr. Finch wanted to use a heat pump as the only source of heating and cooling but found that heat pumps were not suitable for northern areas unless an additional electric heat unit was used. At that time, now 30 years ago, heat pumps lost their efficiency at 32 °F, the temperature at which they switched over to electric. While better now, a heat pump to run well below 32 °F is a serious investment. Russell Finch Home & Greenhouse. Click image for the largest view. Before it was widespread knowledge, Mr. Finch knew that throughout most of the United States, the temperature is stable at 52 degrees F at eight feet below ground. He reasoned that if a heat pump was in a small room, and air that had passed through tubes buried eight feet deep was blown through that room, the heat pump would behave as if it were in a southern climate. Mr. Finch contacted the University of Nebraska to validate his thought process, and was told by two professors that the idea was not feasible. Not that the physics won’t work – just not feasible. Finch then called the heating division of the Coleman Company in Kansas. An engineer at Coleman listened to his idea and agreed it should work very well. Coleman was interested enough to furnish a heat pump at dealer cost. The unit was installed and has worked flawlessly without any alterations for years. There’s a lesson in the stress involved when running heat pumps at low temperature. The Finch designed heating and cooling system uses a 1/3 hp blower to move air in a closed circuit of underground tubing. The tubing consists of seven 6″ diameter solid plastic tubes, with a total length of 1100 feet, buried along the perimeter of a portion of his home. Whoa, that’s only about 1650 square feet of exposure for a two floor home of 4000 square feet. Intuition says that should do it. Keep in mind some subsoil pipe footage is being used to heat the garage. More on that in a bit. Finch Geothermal Home Layout. Click image for more info. Just how this might apply to you depends on climate. Mr. Finch is located at Alliance Nebraska where the average high temperature is 36 degrees and the average low is 10.7 °F. Typically, 20 days per year are below zero degrees F. In July, the average high is 87 °F, with several days above 100 °F. Twice since the Finch’s have lived in the home, the temperatures have plummeted to minus 40 °F. On the other hand – Mr. Finch has a 16’ x 80’ greenhouse as well. Add to that Mr. Finch isn’t terribly interested in promoting his know how. There is but a paucity of information. The available numbers for annual costs include the home and greenhouse are from March of 2001. Add in he’s irrigating over an acre of lawn, the water and power total comes to $2400 in 2001 dollars. 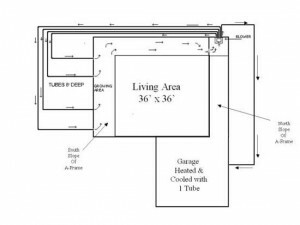 Lets see, living area, garage, greenhouse, that’s passing 5500 square feet. Yet there is one other input – the solar gain with all those windows is going to be massive. Finch Geothermal Home Circulation. Click image for more information. We have no good idea what the value of the system calculates out to be. But Finch has two other projects behind him. The results of which are unknown. He used to offer his know how in a booklet for $12.95. Currently a downloadable e-book is on sale promoted by the GreenCube Publishing, a division of ISBU Association, Inc. for $24.00. Curiously the publisher is offering a “demo” that offers up the first pages. But nowhere is the math and physics worked out. Mr. Finch and his publisher would do quite well to get that information into the demo and the in highlights on their website. Most folks assume that liquid is more efficient than gas for a circulator in a cycle. That’s a case begging for proof in a cost analysis. The up front investment, operating expense and maintenance are primary considerations. Handling fluids is more demanding, in power to move fluids and the cost to build leak proof systems. Air would need cleaning when incoming, the circulating system some means to evacuate condensed humidity and cleaning the pipes of the stuff that will make a home there. Neither system is perfect. Yet the power to move the air is a fraction of the power to move antifreeze and water. An air to air heat exchange system is flat simple, and one might suspect Finch is dumping outbound flow straight into the home for air conditioning, only adding some heat pump heat exchange in the cool and cold season. Air to air to geothermal looks very attractive compared to air to water to geothermal on sunk investment and operating costs. Now if Finch and the publisher will “show us the beef” as it were, one could get real interested. But you have to be just smiling proud of Russell. All that’s needed is for someone to figure out a low cost way to put these kinds of things in suburbia-sized lots. ‘Most folks assume that liquid is more efficient than gas for a circulator in a cycle.’ That is 100% guaranteed not assumed! You may find some special circumstance where air is OK but liquid is far more efficient. This system can not compare to a GSHP with either ground coils or wells for heat transfer. Handling of fluids is so difficult? You are busy being a great source of disinformation! Leaks? You use the correct pipe and install it correctly! Cleaning up the air from this system would be problematic – you would never know exactly which bacteria or fungus you are looking for. What Finch has done is great for him but a commercial model? İ don’t think so. I was reminded of these guys and heatpump improvements for below freezing. I thought of this approach a while back, but was not able to do anything about it. The air to ground solution seems painfully simple. With a good air filter in the mix, it seems to me that one should be able to just pipe the cool air into your house for cooling. For heating one should be able to use the same kind of heat exchange technology used for above ground heat exchanging. You would then blow the heated air through the underground area to be cooled. Russ says that it is a certainty that running a liquid is more efficient than running gas. I question his certainty. (As I see it, such certainty steifles experimentation.) There is never liquid to ground contact in a heat pump system, there is liquid to plastic, plastic to ground or liquid to metal and metal to ground. Metal piping is surely much more expensive than plastic, but plastic is the poorer conductor of heat. Further, if you have the air running through a field of small rocks, the surface area of contact between the air and the ground is enormous compared to the surface area of a smooth, round pipe. To dismiss this approach out of hand as russ has suggested is unwise. Russ also mentioned the possibility of growths in your heat excnange field. This is a valid consern, especially if you are pumping the cold air into your house directly for cooling. In a heat exhange system, however, I doubt that growths would be a problem unless they got significant enough to actually slow down airflow through the exchange field. Russel Finch, all power to you. If you can cool the world with an underground field, if microorganisms don’t get you, you will have done more than your part in reducing global warming. If you can heat the world at lower cost than existing heat pump systems, again you will have done more than your part. I say, ignore the russes, even if they turn out to be right. @bfast – stifles experimentation? İ was under the impression that science and engineering mean something. We don’t keep trying to invent or discover the same thing time after time. We don’t need to make the same mistakes as others have. We look for something new to try. This is not a new concept – you can read many articles about it on the net. İt is a failed concept though. İt may work for a specific situation but in general, no. İ was talking about mildew in the ducts which is another given if there is no method of cleaning. İgnore history, science, engineering and whatever information you can find if it so suits you. The thing that amazes me most about the bfast’s (greens) of the world is their fantastic lack of knowledge or ability to think. People seem to think that if you just wish real hard good things happen. Ground source heat pumps do work – they are a big step farther than the direct method described above. They use the heat in the ground to heat or cool in a manner that does work. Imagine an 8150 sq. ft house with a cost to heat, cool, and provide hot water, at an ANNUAL cost of $876. That’s roughly 2600 more square feet of home, and a $1524 savings per year. Oh yea and that $876 a year figure is with today’s electric rates. Not rates from 2001. Happens every day with every geothermal system that I install. Unbelievable utilities, unbelievable comfort, undeniable return on your investment. In my understanding this system won’t work as well as a liquid Geothermal system. It can’t get as hot or cold. It has a poor surface area for the transfer of heat (not yet mentioned). Yet its positives are it is drastically easier to install (suggestively DIYable), A lot less components, therefore much cheaper initial installation. Also by having it go from air to air there is no exchanger which a fair amount of efficiency is lost here. In my understanding (correct me if I’m wrong) but the often failure of geo-air is that the pipes due to condensation and the flow of oxygen are a breeding ground for mold,etc. Yet this system I believe requires frequent placement of some sort of anti-bacterial product into the pipes. I believe that to be the only major pitfall. I am guesstimating on costs but 3500 for 1100 ft of pipe and 500 for a 1/3 hp pump should come to 4,000. And for a standard 3 ton just the unit (no piping etc) come up to 6,000. And with the lighter load on the pump it should last quite a bit longer. So ya let me know if any of my ideas are misguided :-). Thanks. Bryon, I’m not quite sure what you mean on your theory of the bacteria in the pipes. We install our closed loops with water, and sometimes an antifreeze. We power flush the system to purge any air from the loop. The system recirculates the same water all the time. Typically around a 100 gallons or so, depending on the size of the system. We do not have any problems with bacteria in a closed loop system. We do have problems on occasion with open loop systems and bacteria however. But those problems are because of the water source that the water is obtained from. That being said, there should be no condensation in a closed loop. All oxygen is removed from the system when installed. Controls should be installed on an open loop to keep pressure on the water heat exchanger in the geo heat pump at all times. So oxygen should not be a problem on an open loop either. Pipe lengths can vary on a closed loop. The last loop I installed had 2400 foot of pipe installed. Soil type and depth of bury all play major roles in the length of pipe that goes into the ground. My heat pumps installed on a closed loop system have a life expectancy of 25 years, with little maintenance required. They are 500% efficient, and also have desuperheaters in them to provide a portion of your hot water requirements for almost free. Free in the summer, but at a minimal cost in the winter. My heat pumps installed on an open loop system, have a life expectancy of about 15-20 years and will require more maintenance. That maintenance depends greatly on the quality of water flowing through the system. A typical return on your investment with an open loop system can be as little as 3 years. A closed loop system can be as little as 5 years. Your figures for a geothermal system are not too far off. They could easily be more depending on the type of system to be installed. ie: single stage vs. two stage, conventional fan vs. variable speed fan, hot water heating vs. no hot water heating, single zone, vs. zoning. We also sell a combo unit that heats water for a radiant heating system as well. Or it could be used to provide domestic hot water as well. The possibilities are endless. No doubt about it though, you will pay more up front for a geothermal system. But with 30% back in tax credits from the government, and a short return on your investment, If you plan on selling your home or living in it more than your ROI. Geothermal is the only option. It drastically reduces your carbon foot print as well. Sorry I’ll quit with the sales pitch. I get started and can’t seem to stop. Hi Justin, all the information you provided seems to be very correct. I should have clarified my self but the system I was referring to was the Geo-Air system stated in the article. I was not intending to downgrade the Geo-Liquid system. Geo-Air is a system is quite different in that it is ALWAYS open loop and Air is the only thing that passes through the whole system (including pipes). Suggestively all that happens is that it takes air from your home and circulates it through 6inch pipes to cool it down for summer (extremely cheap and best scenario). During the winter (if I understand) a vacuum (of air again) is created in the pipes essentially creating a void for hot air from the ground to seep into the pipes creating your hot air. The question is can Geo-Air be a viable option? Can the issues such as mold be overcome? Are there any other issues with the system such as reaching 80-85 degrees to heat a home? Does it replace the need for any form a Geo-liquid system or is it only supplemental? Etc. like many others, I’ve likely stumbled upon this article while looking to see if what Russell Fitch created is actually viable. I’m not an engineer, nor do I know all that much about how existing liquid systems work. Having said all that I tend to wonder why people conjure up these crazy ideas like bacteria being an issue or problems with humidity? Those have fairly easy fixes. You can add a dehumidified to the system and install a UV sterilizer which would knock out bacterial issues. … and before I get complaints that I’ve added some cost into the system let’s remember that there is no ‘simple’ device out there. Engines require radiators &/or air cooling, power plants convert fossil fuel or steam to rotary energy which power electrical stators, etc… So as far as I’m concerned, I fully realize that a true solution expects a fair amount of complexity. To me, this system seems too simple. What I’ll agree with here is that Finch offers little scientific data which is a big red flag. Now if I were considering digging up my yard to install something would I really want to go his route (blindly) or would I stick with the more expensive solution which has a significant install base? By the way, who was it that said typical systems have a 25 year life expectancy? If I’m installing something 6-8′ underground it better last a hell of a lot longer than that considering how long the ROI timetable is to begin with in my region. I have been looking for alternative heating for greenhouses for our nursery and this concept seems very interesting. I had seen a greenhouse years ago in Kentucky that was attached to an old coal mine at the end. They installed a large fan to blow air down the coal mine during the day as it heated up and would turn the fan off during the night for the warm air to flow back into the greenhouse keeping the temps in the 50s to 70s. So the system can work at least for my uses. It makes me wonder can a system like this work for me would I no longer need to burn wood or gas to heat my larger greenhouses? Could I lay some pipes and push air through them to keep my greenhouses at a constant temp? If so how would one figure out the amount of pipes needed at which depth? I would consider putting in a system myself but I would like to know more of this concept and what would be needed. For anyone interested in figuring this out I have a 96 foot long greenhouse 21 feet long and 15 feet tall at the peak. @ Brian – In using the old coal mine they had a very large volume to work with in relation to the amount of volume to be heated and the amount of air moved – the perfect setup. That is in a complete different ball park from what was described in the post. Big volume to heat and very small plus close to the surface volume to collect the temperature from. If you have access to an old mine you may get heat. If you have access to a cave you may get cool. I just want to tell you that I am just all new to blogs and truly liked this page. I’m planning to bookmark your blog post . You certainly have perfect articles and reviews. Bless you for your website pages. Regarding Russ Finch and his “geo-air” system: I’m amazed at the negative without basis. My brother was one of the USDA reps that visited Russ’s facilities. The “solid” fact is, IT WORKS! All three types of his geo-air systems work! No mold. No bacteria. As post said earlier, …these are simple solutions for anyone with the slighest intelligence. 30 some odd years it has worked and is real, not concept. The USDA team was very impressed. I just ran across this blog,didn’t take the time to read all of it. Just to update some of the progress: The original structure was wood and was 18 years old it had rotted to the point that we had decided to destroy it and cover the pit in. A nursery near us heard about us and visited. They were so interested in our energy savings that we backed off and looked at the commercial values. They are so impressive that we decided to design a new stop structure, I have used what we learned from the first 18 years. we added 2′ more Lexan to the South side and changed the angles for better use of the winter sun. We have angled the North wall and added silver foil to reflect the light. In the last 1 1/2 year it has made the system even more efficient. The unit is 85′ x 16′ and 12′ high. Everything we did originally was hobby/experimental we tried every plant we could find to see how it would perform. This is not a conventional greenhouse it is a cool house. We only keep the plants above there cold damage point. Some of the plants don’t do well in this climate, but we found a lot that thrive. Citrus, figs, grapes, blackberries,etc. are some of the best performers. We have 19 citrus trees (many types) 4 of the oldest citrus,Eureka lemon, Meyer lemon, Valencia orange and Washington Navel orange take up 8’x 21′ these 4 trees produce over 475 pounds of fruit a year at this rate we think if the trees were placed right(and we learn more about citrus) we can produce around 3000# a year on the North side of the unit and have 8′ for other types of vegetables and plants on the South side. Our entire energy cost for this unit is less than $600 a year. We use no backup heat only low grade (heat from 8′ depth) geothermal. We are getting more interest all the time and have built a 54′ unit at one of the area high schools and will build another larger unit at the Alliance Nebraska high school this coming spring. The metal framed structure we are going to market is the frame and Lexan system. All the other parts are available at Menard’s or Home Depot. You published an article about our use of “low grade geo-thermal” in January of 2010. This article was how we use ground heat to heat our home. The home heating system has been a great success and it has developed into using the same principals for our greenhouses. What was a hobby for 18 years has now become a thriving business marketing the frames and polycarbonate glazing system. We have improved on the original design that is 23 years old now have 78′ greenhouses that grow citrus trees 12′ tall, each tree produces an average of 125# of top quality fruit per year. We also grow hundreds of other plants tropical and sub trop. A unit we completed in 2013 has averaged less than $1 a day for total energy for a year. We now have greenhouse is 3 states and many more in the future. The cost of the average 78′ x 16′ x 12 high greenhouse with automated heat and ventilation is between $15 and $22 thousand dollars depending on how much construction the owner can do himself. The newer design uses 12 4′ tubes each between 200′ and 250′ in the original unit we realized the 120′ length did not harvest all of the available 52 degree heat so we added the extra length. The first 2 greenhouses to be used for commercial are being built in south west South Dakota and north east Wyoming. When finished the Wyoming unit will have near 400′ of greenhouse can house up to 80 citrus trees. 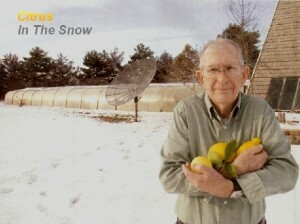 More information is available at “greenhouse in the snow” online. Time for the yearly update! You have to love the good ol’ boy attitude of rural Americans. Let’s not cloud the water with too much theory – just put the science to work and test it. Since this article was posted in 2010 a lot has happened. Less than 2 years ago we decided to market just the frame and Lexan glazing for the greenhouses. At this time we have 16 greenhouse in 6 states and many will be built this year. We have developed the design and growing system to the point that the high plains and Sandhills of Nebraska will become a major producer of table citrus in the next 20 years. our price at farmers market for citrus is an astronomical 39 times the price USDA statistics list for average commercial growers. With the new economically priced grow lights we are working with it looks like we can more than double the production. Nearly all the units we sell are for commercial production on farms and ranches. At this time it looks like the price for citrus will remain high because of the HLB disease that is destroying entire groves of citrus around the world. The design and growing system is ideal for smaller low cost units on farms and ranches the trees require only 20% of the growing area other vegetables and floral crops can be produced. I just haapened to read your article of Heaig from the earth for internet searchig. Currently I am going to build the energy saving green house to grow plants all the year round with min. energy cost. My living area is smiliar to that of Nebrasca. I would like to have your booklet. It would the most helpful for my small projet – building energy saving greenhouse of 3200 square foot. I don’t mean to be a simpleton, but sub-basements (roof at 8-10 feet below ground-level and floor 16-18 or more below grade) show up around where I live (some of the ritzier homes turn them into basketball courts and rock-climbing walls). Is there any reason a simple sub-basement wouldn’t do the trick for this issue in a house? Why not put a sub-basement in a green house as light-assisted area full of tilapia and LED grow lights? Or keep dark as a mushroom growing area? I am doing this topic for my school project and i am happy to come across your website. This is truly useful to me. If I understand this statement from Russ how would someone is a somewhat warmer zone, such as zone 6, operate making sure that mold and bacteria did not grow? Our winter temps are not as cold. It would be entirely possible to use a deep basement as a growing area. The temperature would be even more stable than our greenhouses. Conventional “old type” grow lights would probably be too expensive buy and energy would be high. They would provide heat that might offset costs if you were to grow crops requiring higher temperatures. The LED panels would be the best choice I think. A Greenhouse in the Snow unit near Taos NM is growing button mushrooms as a crop and to produce CO2, it is working very well. We have a unit near Mitchell Nebraska that is raising tilapia in the greenhouse. That’s great, Russ. Keep that progress coming! Russ, this is great stuff. It just proves that sometimes the best solution to a problem is the simplest and cheapest. I’m very interested in constructing one or more of these to turn it into a farming business here in northwestern ontario where it’s not unusual during winter to get up to -40 degree C temps and sometimes more. I also see that this would be great for boosting the performance of a heat pump system that is basking in a relatively constant temperature and not having to deal with such temperature extremes. We are convinced we have developed the design for “Greenhouse in the Snow” pretty close to the limit of efficiency. Now we are fine tuning it with several ideas of a simple heat storage for the heat that accumulates at the peak of the structure on sunny winter days. Also we have a new system of introducing ventilation air through ground tubes, this will eliminate the need for automated shutters that have been a source of radiated cold and high maintance during the winter. We now have 21 units in 6 states and Canada. we are excited about the latest greenhouse being constructed in the poorest region of the U.S. on the Pine Ridge Indian Reservation. This unit will have all of the newest ideas we have. Murphy says: The important things are always simple. I say: If you have something good going, shutup. At this time there are 6 Greenhouse in the Snow units being built and many more planned. We have improved efficiency by removing the automated shutter that radiated cold in the winter and had problems a problem with louvers not closing tight. in the new design we use a wheel blower to build a vacuum in the entry room that draws fresh air through a separate set of geo tubes. We also store heat from the peak area in a rock bed that also serves as the path through the length of the greenhouse. The average cost of a 90 foot fully automated greenhouse is around $22,000 if you can furnish your labor and have access to a backhoe. We now have 38 greenhouses in 7 states and 4 more to be built soon. Almost all of the units built in the last three years are for commercial growing farmers market or direct from small local farms. Thank you for your caring and ingenuity! Has anyone tried this type of project in central Ky (Madison County)? This last winter it was extremely cold w/ much snow, but now, June and July have been extremely hot & humid. Though you don’t have a problem with mold in the piping where you are, I’m pretty certain it would be here, where summertime brings announcements on TV about the level of molds in the outside air (& green starts growing on the outside walls of our houses, like it does in FL). Do you have any ideas? If it can be done, I’d build one. If yes, please say how. Thanks! I love this idea and loved reading the booklet. Now, do you have a list of the greenhouses so that I can visit one near me? I would love the names and phone numbers of the owners who have actually built this same type of greenhouse. Looking for help, and cannot find anyone who has built this greenhouse or has heated and cooled their home with a Geo Air simple system. Needing help soon!